With the identification of several patient characteristics with prognostic impact on long term survival a scoring system was introduced in 1997 by the International Germ Cell Cancer Collaborative Group (IGCCCG) resulting in “good”, “intermediate” and “poor” prognosis. Patients of the intermediate prognosis category reached a five year overall survival (OS) of 79%. The standard therapy for the intermediate prognosis patients consisted of four cycles of cisplatin, etoposide and bleomycin (BEP). 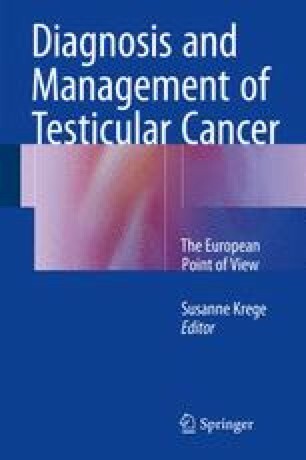 Within this book chapter we present and discuss the clinical trials that were performed to test treatment regimens for intermediate prognosis patients. The review of these trials revealed amongst others that the application of more aggressive treatment regimens such as high dose chemotherapy did not automatically lead to improved outcome. However, regardless of the absence of a superiority of new regimens compared to the standard BEP regimen, almost every trial has demonstrated that the outcome for intermediate prognosis patients has improved over the past years compared to the data presented by the IGCCCG. Experience of the treating therapists and the improvement of supportive care such as the application of novel antiemetics and the use of growth factors may have led to this advance. On this note some authors even conclude that some intermediate risk patients may be overtreated by four cycles of BEP. Therefore an individual treatment adjustment may be a reasonable option, and indeed one clinical trial registry demonstrated a 10-year OS of 90.0% with a strategy by controlling the treatment intensity based on the decline of the tumor markers. However, clinical trials which are prospectively testing a dosing deescalation strategy are not available.